From basics to advanced tips, if it has to do with electric flight, you'll find it here. This was written in response to an e-mail by a new member. This is one man's opinion. Feel free to correct me (Marshall) on the theory. However, you can purchase a pre-built one and save the headaches at progressiverc.com... here's an example: https://www.progressiverc.com/hardline-powerlab-1000w-combo-2982.html (although it doesn't have the parallel board or Bump Controller from Revolectrix). Look under their Charging menu for your various options. Power is measured in Watts (W), potential/voltage is measured in Volts (V), and current is measured in Amperes, or amps (A). Battery voltage, while measured in V, is typically expressed as an "S" - meaning batteries in series. For LiPo chemistry, that gives you a voltage by multiplying by 4V per cell (3.7V nominal). That's why a 3S is often listed as an 11.1V battery. At full charge it's at 4.2V per cell, though, and at the low it's at 3.7V per cell, so 4V is a good in-between. You can calculate voltage drop online at a gazillion calculators, such as https://www.rapidtables.com/calc/wire/voltage-drop-calculator.html. Resistance is measured in Ohms or milliOhms. Using the above equation, you can literally say that 1 Volt = 1 Amp-Ohm or 1,000,000 milliAmp-milliOhms or 1,000 Amp-milliOhms. Battery capacity is an amount of charge, literally excess electron particles, which we typically measure in Amp-hours or milliAmp-hours (mAh). Charge would normally be measured in Coulombs, but that's not very helpful for us because we think in terms of hours or fractions of an hour. 1 Coulomb is is 1 Amp-second, meaning 1 amp of current into a capacitor or battery would store 1 Coulomb in 1 second. That means one Amp-hour (1000mAh) would be 3600 Coulombs. We also switch back and forth between Ah and mAh hour a lot, often for no particular reason. They're equivalent at a ratio of 1000. A 5000mAh battery capacity is the same as a 5Ah battery capacity. I personally prefer Ah. The charge and discharge rates of a battery are measured as a multiple of the capacity, meaning that a 2C charge rating will allow you to charge in Amps at twice the Amp-hour rating, or in milliAmps at twice the milliAmp-hour rating for the battery. The discharge rate is always much higher, but its the same idea. On the low end we fly 20C discharge batteries. On the high end, many us who fly drones are flying 120C discharge- rated batteries. The former, and virtually all basic lipos can only be charged at 1C. This means a 2650mAh battery could only be charged at 2.65A safely. NEVER CHARGE ABOVE THE RATE GIVEN BY THE MANUFACTURER, typically on their website or a sticker on the battery. Some give conflicting information...a battery might be rated for 8C on the website, but list 1C on the battery for what I assume are liability reasons, or perhaps they didn't want to print different stickers. High-C-rating batteries are not needed for all applications. The batteries that fly the Apprentice are about the cheapest batteries you can buy, and only need a 20C discharge rating. A 2.2Ah battery pumping out 10C is providing 22 amps. That's plenty for our Apprentice. On the other hand, plug a 20C battery into an Avanti EDF jet and it will be fried and worthless, possibly on fire, by the time you land. You'll need to know amp draw for the application. The more-expensive lipos (60-120C or above) can be charged at 5C, 8C, even 10C, but a 3Ah battery charging at 8C would require 24A, so buying expensive batteries means you're gonna have a highly capable charger, or you're gonna want one soon. The 120C batteries are used mostly for drones, but I buy highly-capable batteries (60C and above), and buy less of them, because they charge so much faster, so it's more economical in the long run. This approach has proven to be a bad idea for CombatONEs... I've torn up a lot of expensive batteries in crashes. Trade-offs is the name of the game in electrics. It all depends on what you're going to be flying. I built what I have after purchasing a 50cc aerobatic plane that had been converted to electric which flew on 12S 5Ah (2 6S in series), so I generally charged 4 of them at 10A each. I subsequently experienced (and learned from Jonathon Hendrickson) that these size planes are better flown with gas... anything at or above 20cc engine size rating is better as a gasser... only needs electric if you want to do it for fun, although there are a few small performance benefits. Incidentally, in our parlance, all planes are typically rated as the displacement of the engine for that size, e.g. 100cc plane or 50cc plane. With that in mind, now my setup (PowerLab8 with Bump Controller, Revolectrix paraboard, 24V 1500W PSU and 24V dual wheelchair battery power for when no AC is available) is probably more "nice to have" than "need to have." However, when I want to charge six 4S drone batteries or six 2S indoor batteries, I'm a happy camper. Not to mention wanting to fast-charge two 6S 5Ah batteries at 20 amps each. The Bump Controller let's me parallel charge any batteries with the same chemistry and number of cells without thinking about anything. I can bump a 3S 2.7Ah Turnigy Nano battery and then two 3S 2.2Ah ThunderPower batteries and one 3S 3.2Ah Revolectrix batteries and the Bump Controller will charge at the lowest safest rate for that mix. The Turnigy can charge at 3C = 3x2.7 = 8.1A, the ThunderPowers can charge at 5C = 5 x 2.2 = 11A, and the Revolectrix can take 3C which is 9.6A, so the BumpController won't charge at higher than 8.1A x 4 batteries = 36.4 Amps, but it WILL charge at 36.4 amps, so that's nice to have. For fixed-wing applications, if you follow the previous prescription to fly gas engines in 20cc size aircraft or larger (and I mean gasoline, NOT messy, expensive glow), then the only time you'll use the bigger batteries would be to fly EDF jets like the Avanti S we all love. Then you'll be into expensive 6S 5Ah batteries. If you want to charge them relatively, fast, then a setup like mine starts to make some sense. I have a 1344W, 40A charge ability at 8S or 32V. For example, I find myself often charging 2 6S 5Ah batteries at 20amps or 4 of them at 10 amps, which is 40 amps X ~25V = ~1000W). I can charge at 8S (8 x 4.2V) at 40 amps, which is where the 1344W rating comes from for the PowerLab8. With rotor applications, all bets are off. Buy the best charging setup you can, typically. The dual PowerLab 8 build above was for a 600-700 size heli pilot flying 3D. I don't know much about Jim Beerman's charge station, but if you can find out the power rating (watts) and the S-rating (which turns into volts when you multiply by 4V per cell) and the current rating, you can easily figure out what level of charging you can do with it. . I know he flies EDFs jets using it to charge their big batts. You could go that route and then buy a paraboard. I always recommend Revolectrix paraboards because they're so well-made and safe. It may not even be necessary to buy a paraboard if you can quickly charge two batteries and you purchase fast-charging batteries with a 3C or 5C or above charge rating. As for brands, so much of RC is almost unnecessarily complicated. Things often are that way in a lot of hobby industries. If you bow hunt, the number of bow manufacturers is ridiculous. I'm not sure how they all stay in business. Same thing could be said for chargers. Having said that, I obviously like the Revolectrix stuff. I also really like the iCharger stuff that I've seen. I believe the pre-built brands sold by ProgressiveRC are all good. What am I going to fly and what LiPo batteries will I use? Bear in mind that what you're flying will likely change drastically over the next few years. Where am I going to store my batteries? Ammo cans needed. What am I going to use for a charger based on my needs? What am I going to use for a power supply based on my charger needs? Do I have adequate grounded AC outlet for that (might need a 20A wall plug circuit, or two 15A wall circuits on separate breakers depending on your PSU)? Am I going to use a marine battery at times instead of a power supply? If so, how will I charge that (I use the Battery Minder). Do I want to increase my parallel charging capability with a paraboard? How will I measure voltage safely and quickly at field? PowerLab can show you individual cell voltage but much easier to pick up a quick LiPo voltage checker. The kind I have is far more accurate than the ones we use for QuickSTART. If you go with a Bump Controller, you'll need to purchase batteries from Revolectrix with bumptags installed, or buy bumptags from Revolectrix and install/program them on your batteries (more likely the latter). Based on the above, if I were you I would start with something less expensive like Jim's and then sell it when you're ready to go bigger and know better what you're going to be flying, unless you just like the ease of something like the Bump controller. That's what most of us did, often for years before upgrading. Of course, "less expensive" could still be in the $200-300 range. Most of all, spend time online researching stuff before you pull the trigger on a purchase, the $50 GT1000 charger offer notwithstanding - that one was so cheap and good it was low risk. Winter is on its way and you may not know it but your electric planes need some winterizing just like your gas or glow planes. You need to pay particular attention to your batteries. There are several different types of batteries and different storage methods/procedures for each. LiPo batteries should be stored at about 50% capacity. This is approximately 3.75-3.85 volts per cell. They should be stored in a cool dry location in a LiPo safe bag or fireproof container. To get the best possible capacity retention your LiPo should be stored at 32° F. Storage at this temperature has a capacity loss of 2% per year. Storage at 72° will result in a capacity reduction of 4% per year. A good way to achieve the 32°F storage would be to refrigerate them, but make sure that the batteries are placed in a plastic bag to protect against condensation before putting them in your LiPo safe bag. LiPo’s should always be stored in the method above even during the flying season. It is good practice to charge the battery to full the same day or the day before you are going to use it and then return it to 50% capacity for storage. LiPo’s left fully charged will have their useful life drastically reduced. LiFePO4 batteries store similar to LiPo’s, but do NOT need the special LiPo storage bag for fire prevention. However the storage voltage is less at 3.2-3.35v per cell. They should also be stored at lower temperatures like the LiPo’s. Ni-MH batteries should be kept clean and dry during storage. They can be stored for many months in a charged or discharged state without any detrimental effects as long as they are not exposed to extreme temperatures for any long period of time. After storage the battery should be charged and/or cycled before use. Let’s dive a little deeper into motor, propeller, and electronic speed controller (ESC) selection. 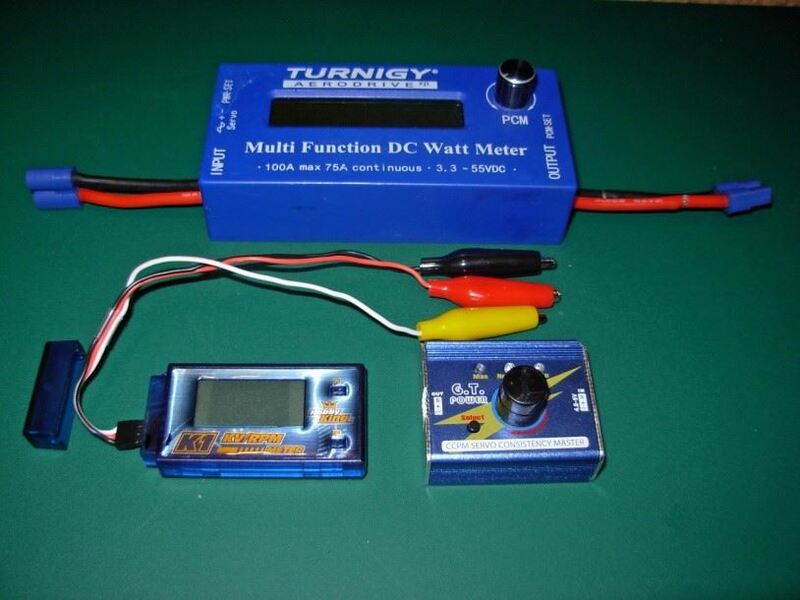 In particular we will investigate the Turnigy 3536c 1100Kv with several APC Electric propellers and a Turnigy 60amp ESC. 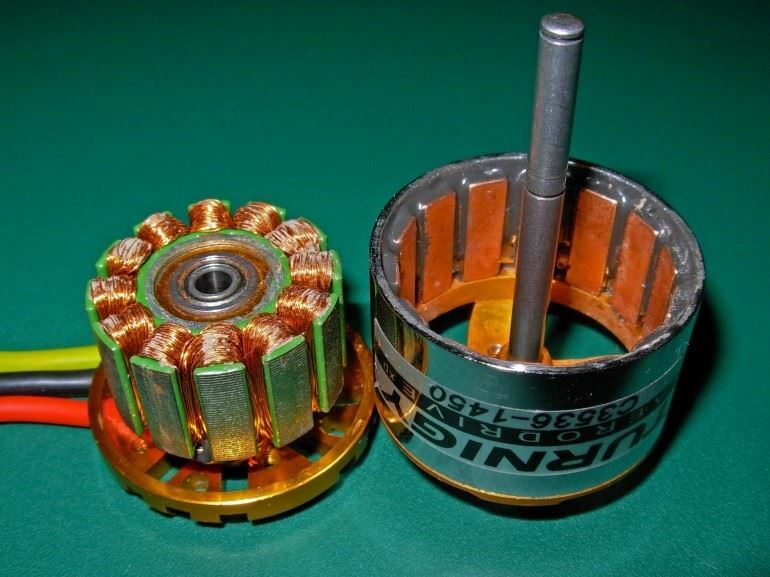 The Turnigy 35-36c is a brushless outrunner motor. 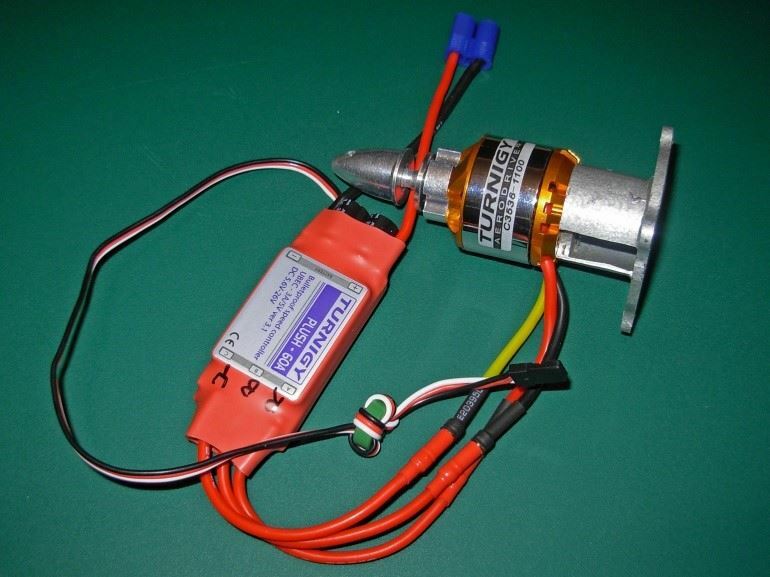 It is advertised as a 1100Kv motor for 2-3cell LiPo with a power output of 400+ watts at 35amps. When this particular motor was measured it had a no load kV of 1120. This motor has 12 poles on its stator and 14 permanent magnet poles on the bell. This is a common stator/permanent magnet combination known as 12N, 14P. This configuration is used where high torque and low RPM are utilized. Many may ask, “Why are there more permanent magnet poles than stator poles?” The difference in the magnetic poles is like a gear ratio. The stator has to switch magnetic fields 7 times to get one revolution on the bell, but only has the ability to switch 6 before repeating the first one again. The ratio of this motor is 7:6 or 1.167:1. This means the magnetic field of the stator is switching faster that the bell is turning. This is similar to a planetary gear set. This setup was tested with various APC electric propellers with worst case scenario conditions. The motor was mounted onto a common adapter mount and then mounted to a bench top. The only place for air to flow was down from the ceiling and then compressed onto a bench top. This could be referred to as an abuse test. Conditions would be more favorable if air were allowed to freely flow as if it was mounted on an airframe, but this placed the most load possible on this setup. By testing the setup in a worst case scenario, we know that it is not possible to achieve any less favorable results or put any more strain on the system. When gathering data for this setup each propeller was run at full throttle for 20 seconds before data was recorded. This was done to eliminate any peak performance data that would come from a short burst at full throttle. 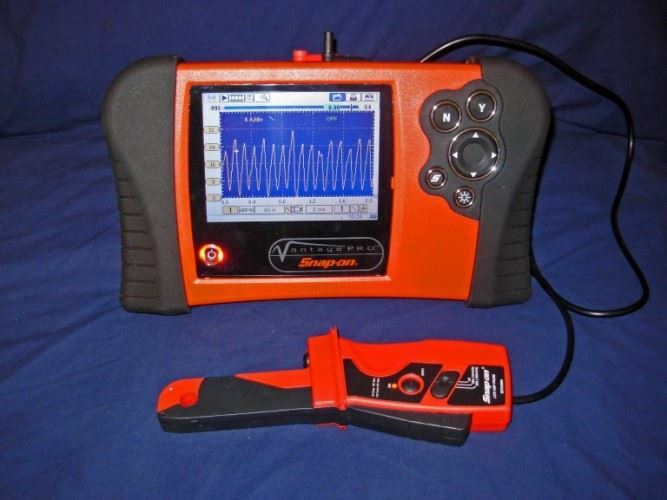 This would allow time for battery voltage to settle or stabilize under full load. The test was performed with two 2200mAh 3-cell 40c LiPo batteries with a full charge switched halfway through the test. This information is used when selecting the right propeller for the application. The props tested are just ones that I had laying around. Prop selection has several factors to be considered: Battery life/amp draw, speed, and thrust. I did not test thrust on this trial. Generally lower pitch number equals higher thrust. For a 3d model you will want a quick spooling propeller with a large diameter and low pitch number. For an all-out speed plane you want the largest pitch number with the smallest diameter, but thrust is still needed to overcome drag. An aerobatic or sport propeller will fall right in the middle of the 3d and speed planes. In the table above you will notice that the 9x6 and 11x7 props produce about the same pitch speed. The 9x6 will have a longer battery life, but will have less thrust due to a smaller diameter. The 9x9 and 10x10 props produce about the same pitch speed, but the 10x10 is going to use up the battery a lot faster. (Yes, the props were probably stalled in the test. Yes, they will likely unload a lot in the air.) 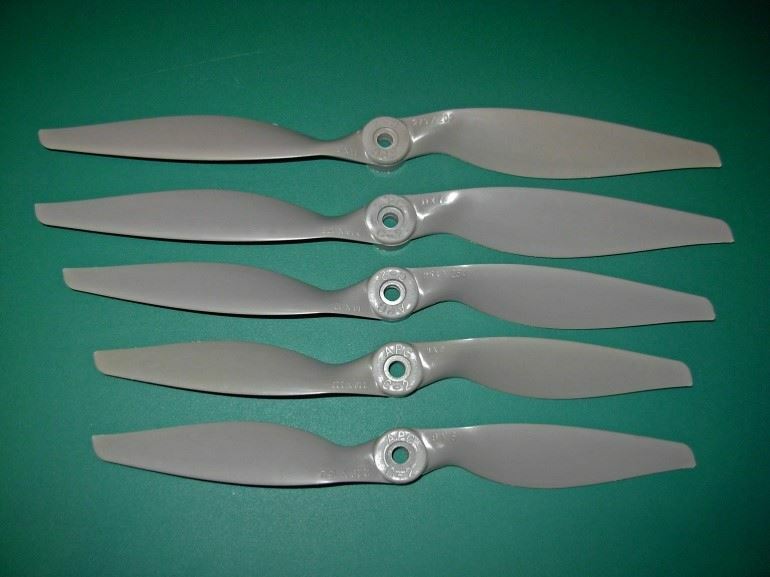 After all the bench testing is complete and you know that the propulsion system will not be harmed when flying, fine tune your prop selection to fit your flying style. 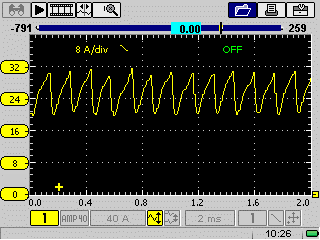 To get a little deeper into the test, a lab scope was utilized with a low amp probe to get a picture of what the ESC was doing to make the motor turn. The images captured were with the APC 9x6 prop. Measurements were made at the battery and not off of one of the 3 legs of the brushless motor. The battery was at 50% at the start of the test and is why the highest average amp draw is lower than what is stated in the table. The above screen shot is at 1/3 throttle. Notice that the amperage spikes are at 24 amps. The watt meter read only 12 amps. This is because the average draw was 12 amps, but we know that the system was actually seeing spikes of 24 amps. In the test data in the table we saw an amp draw of 30 amps at full throttle!!!!! At half throttle we see an occasional spike of 31 amps and an average amp draw of about 25 amps. Notice how the graph has rose up off of zero and there is always some draw. This is to overcome electromagnetic induction from the stator poles that are not energized. Let’s explore electromagnetic induction. Any time a magnet passes a coil of wire it tugs on the electrons and generates electricity. This is how a generator produces electricity. By spinning an electric motor you are moving magnets past coils of wire generating electricity. The faster the motor is spun, the more electricity is generated. This is where we get the maximum RPM of our brushless motors in a no load situation. Once the electromagnetic induction creates a voltage equal to the input voltage, the motor cannot be turned any faster (in our motors) (there are a few exceptions out there but it involves weakening the magnetic fields…) This is why the motors reach maximum RPM at no load when they have not maxed out the switching rate of the ESC. Full throttle looks different than all of the other screen shots. Again this is to overcome greater electromagnetic induction due to higher RPMs. 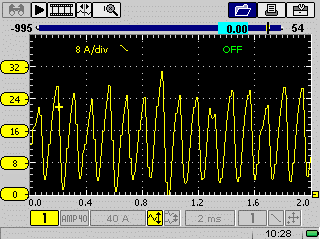 Notice that there are no less than 20 amps being drawn and peaks reaching about 32amps. Average amp draw is about 27 amps. Since we have looked at the screen shots we can now see that amp draw spikes are generally the same between all throttle positions. The frequency of the spikes and the amperage required to overcome the electromagnetic induction is all that is fluctuating. This is essential information that needs to be considered when choosing an ESC. 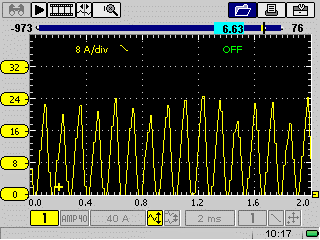 You are always seeing amperage spikes of close to peak amperage draw at even low throttle settings. This is not apparent when using a watt meter that only gives you the average amperage draw. Say you choose an under rated ESC, in this case we’ll say 20A rating and plan to set the transmitter to a maximum of 80% of the throttle travel so the watt meter never went above 20 amps. You might think that you were not hurting the ESC. You fly it a couple of times and everything is OK. Over time these amperage spikes damage the chips in the ESC and send you favorite airplane in for an “unplanned landing.” You are puzzled…. Your ESC is fried but the watt meter never showed amperage above the 20A rating. So what killed it? The amperage spikes deteriorated the chips eventually causing them to fail. The same way they would have failed with 100% throttle, but took a little more time. To prevent this from happening choose your prop and ESC from full throttle readings on you watt meter while using a fully charged flight battery for that particular airplane. This also is a factor when choosing batteries, some batteries have two different discharge ratings depending if it is a pulsed draw or a constant draw. Our brushless motors are definitely a pulsed discharge. Now that you know what is happening behind the scenes, you should be able to setup more reliable, longer lasting propulsion systems. For any of you that were thrown for a loop with this stuff, feel free to email Jonathon Henrickson at slrcfa.rotate@gmail.com. Click here for a PowerPoint presentation made by John Morgan regarding Electric RC Flight Principles.